С него может выпасть игрушка Необычный компас, которая падает с сумки за даларанский рыболовный дейлик. И мне упала Верховая черепаха (всего 144 мурлока) фармите и верьте, помимо 4 раза упала Морская черепаха интересно можно ли получить ачивку. У меня уже была ранее. А вот монеток упало всего 27 штук, так что ловите сначала черепашек, а потом монетки доковыривайте огромными рыбами. Маунт Верховая черепаха, получен после убийства 48 мурлока. Монетки и правда выпадают с низким шансом. Выпала Костяная удочка,и Счастливая шляпа рыболова с дропом ~как у черепахи.56 килов. Как вызвать (Обитатель пещер Зашедшей Луны)? Начиная с 7.0 можно собирать рейды на фарм черепах, теперь лут с них падает всему рейду персонально. Скорее всего это побочный эффект новой системы, так что стоит полутать черепах пока не поздно! Сейчас ловится элементарно. За 2 часа выловил обе черепахи. За 5 часов набил 150 монет. EDIT: It also drops an Необычный компас and a Морская черепаха. He does drop the Морская черепаха mount as well. I have a screen shot if you need proof. Let the world know: the Murlocs are back. Kill the Lunarfall Cavedweller before you try to summon another one. It will just waste the Lunarfall Carp if you use it and one is still alive. Kill the Обитатель пещер Зашедшей Луны before you try to summon another one. It will just waste the Карп Зашедшей Луны if you use it and one is still alive. Just sold the Sea Turtle Mount, everyone in your group can loot it. I put on Master Loot and traded it after it dropped for 30k. One funny thing, the Sea Turtle mount dropped already two days in a row for me and always on the first kill of the day. Will report tomorrow if it drops again. Comparing to other who got drop at first or after few tries, I got mine ~50 tries. It's not showing yet in the loot table, but you can apparently also receive the toy Необычный компас as loot from these guys. I don't want to know how many I've killed trying to get those stupid turtles. Why are there murlocs on draenor? Today, I dropped 20 Первобытный дух on a Обитатель пещер Зашедшей Луны I Think it's very rare because it seems that nobody found it on the Wowhead addon... Or Maybe a new item droppable by this NPC since the 6.1's release? I just finished slaying my 225th Lunarfall Cavedweller and haven't seen either of the turtle mounts. Nobody understands that RNG is RNG better than an angler, but I was hoping somebody could confirm that the turtles are still in the loot table in 6.1, as it's clear they tweaked the loot table a fair amount (removed Awesomefish, added Primal Spirits, etc). This seemed like a better alternative to Pandaria pool fishing but I'm definitely having my doubts. Thanks, and good fishing! EDIT: Scratch that, found a post over on the Frostdeep Minnow page that confirms the Riding Turtle post 6.1. I'll leave this post here for that information in case anybody else is looking for it as well... plus, consider this some reassurance to fellow anglers that no, not everybody got theirs within their first 50. Nothing to do but to keep at it! Stay sane, brothers and sisters. confirmed. I received Необычный компас today. This needs to be added to the current loot table with the sites next build/data check. Just got a Верховая черепаха - so regardless of the other changes in loot it still drops with 6.1. Yesterday I received both Морская черепаха and Верховая черепаха from Обитатель пещер Зашедшей Луны in the same set of 5 Карп Зашедшей Луны in my bag. Very lucky indeed! Of course this was about 100th Карп Зашедшей Луны I had already thrown in. 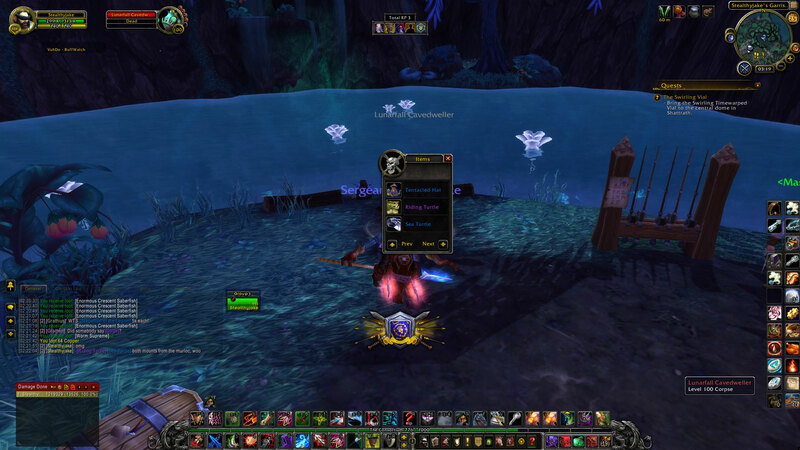 One thing I found useful to increase my odds to getting any particular loot is to ensure I have all the Draenor Bait already in my bag or rather all unique items dropped from the mobs. Since this baits are unique they will not be looted from the Обитатель пещер Зашедшей Луны again while trying to get the mounts. I know is not a big of a difference but your actually eliminating 7 additional items from dropping and when you dont have them in your bag or bank the drop rate is pretty high. Best thing to do is keep them in you bank all 7 baits all the time. If you need one just take it out use it and the next one will be caught before the it runs out in 10 minutes. this way you always have one. Got a Riding Turtle and a jeweled fishing pole after 2 kills only. I guess I got lucky! I was fishing at 900 skill-up (worm and tentacle hat). luckily no diamond cane, or mount, so lucky. only 300, compared to other ppl's 3, or 50, or 80, this is nothing, i gotta keep work @ it. Firstly I'm pretty sure Awesomefish, grieferfish and stranglekelp don't drop anymore as I have not seen a single one of these (possibly add swiftness potion & swim speed potion to that list). Anyone else noticed this? EDIT 2: Got the Riding Turtle on 214 Kills! only the sea turtle to go. * 40x+ each of Ephemeral Fishing Rod, Tentacle Hat, Hightfish Hat. Such a boring grind, especially that you can't hold more than 5 at any one time. Hopefully I get them soon. I think there is a bug with baits, maybe is just me. Tried with physical baits (dropped) and it works perfectly, i could fish 1 each 20 with 1100 fishing skill. But at a certain point, i have lost my bait going to eat, so i have decided to took the bait talking with Nat. Not a single Cavedweller dropped in 200+ fish. Just wanted to mention that they seem to no longer drop Awesomefish , I've summoned and killed around 400 so far, Not a single Awesomefish. Also would like to mention that I did get my Riding turtle and they do drop Необычный компас as well as weather-beaten Journal only to who haven't already got it..
EDIT : I just got the Прибрежный ползун Also got the Battered Jungle Hat to drop, No Морская черепаха yet >_>. This really is a hell of a grind, the worst so far for me. Will soon reach 300 Cavedwellers and nothing so far. My greatest fear is that the sea turtle will drop, the one i already have. On the other hand i got over 100 of Nat's lucky coins. Unfortunately they are worthless until you farm your reputation up with him by farming another 5 billion rare fish. Sadly i realized this AFTER i reached 100 and trying to buy the crimson water strider. Good luck to the other fellow fisherman. 3. Lure bait any kinda u want..
4. MAY lose your mind..... Bring a friend...lol oh yeah my self..
What a grind this is 4th day fishing for this bad boy Карп Зашедшей Луны (alliance side) (horde side) Throw back in and you get a Обитатель пещер Зашедшей Луны and at 395 Карп Зашедшей Луны still no luck at 16 hours a day doing this so far. I want the Верховая черепаха so bad been such a long days. But keep in mind the fish that you have fished can make over 75k just selling them 200 gold a stack in four days. Lots of Королевский червяк. And got my Морская черепаха on my 50th Карп Зашедшей Луны. I have also farmed this Счастливая монетка Ната to get my mount Поводья багрового водного долгонога for 100 Счастливая монетка Ната and my Hat Питейная шляпа Ната for 25 Счастливая монетка Ната and my Fishing rod Дренейская удочка for 25 Счастливая монетка Ната. Day 5 what a grind after a long 5 days it finally drop after the 563 Карп Зашедшей Луны. ill update with a pic soon. Will update, when it drops. Whoop got Морская черепаха yesterday did not even try to get it. Just got my Верховая черепаха drop in Patch 7.0.3. after around 8-10 hours of fishing. With the new Legion loot system you can form (or join) raids to farm the cavedwellers. There is no faster way than having 40 ppl fish in the same lake, cavedwellers spawn every 10 sec. So get out there and grind rhose turtles before B. nerfs this to oblivion! P.S. Just make sure people have the Draenor Angler achievement to contribute! 461 attempts, finally got it today. pre-patch 7.0, fishing in a raid group, personal loot. Had 380 attempts solo with now luck. Running rarity, I was up to 90% "unlucky" rate. I fished up both Turtle mounts in about two hours in a 40-man raid group doing this on 7/24/16. Three other members of my guild did it also (one or both mounts) in a similar time period. It seems can't get two Lunarfall Cavedweller at once, need some coordination, in a big fishing raid. Liking this macro "/use Findle's Loot-A-Rang /use Fishing"
Not clue if they upped thee drop rate but I just unlocked my rank 3 fishing shack yesterday and from my first carp I got I caught it dropped the TCG turtle. Этот NPC может быть найден в следующих зонах: Зашедшая Луна (16).